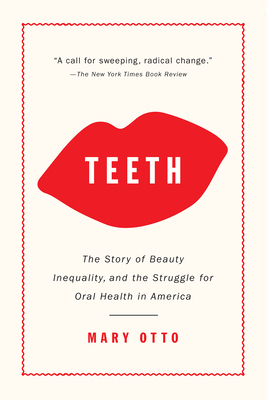 In this brilliant debut book, hailed by the New York Times Book Review as "a call for sweeping, radical change," veteran health journalist Mary Otto looks inside America's mouth, revealing unsettling truths about our unequal society. Teeth takes readers on a disturbing journey into the role teeth play in our health and our social mobility. Otto "doesn't just dwell on the numbers," according to NPR, "she makes what could have been a turgid health policy tome spark with outrage over the stories of people who have suffered." Her subjects include the pioneering dentist who made Shirley Temple and Judy Garland's teeth sparkle on the silver screen; an up-and-coming beauty queen awarded thousands of dollars of free cosmetic dental care; and Deamonte Driver, a young Baltimore boy whose death from an abscessed tooth sparked congressional hearings. Offering "an astute examination of the complex, insular business of oral health care" (Kirkus Reviews), Otto combines searing critique with forward-looking proposals for reform, "sympathetically explor ing] a range of ideas for improving the current system" (New Republic). Muckraking and paradigm-shifting, Teeth exposes for the first time the extent and meaning of our oral health crisis. Mary Otto is the oral health topic leader for the Association of Health Care Journalists. She began writing about oral health at the Washington Post, where she worked for eight years covering social issues including health care and poverty. She lives in Washington, DC.